Since the beginning of the second half of the season, consistency has been an issue for the Stingers, and on Friday night, a slow start cost them the game. The Université de Montréal Carabins secured a 2-1 victory over the Concordia Stingers Jan. 15 at the Ed Meagher Arena. The Stingers are now on a three-game losing streak. In the first period, the Stingers struggled against Montreal’s physical game. Carabins forward Cassandra Dupuis gave her team the lead less than five minutes into the period, beating goaltender Katherine Purchase through the five-hole, which is the space between the goaltender’s legs. The Carabins remained dominant for the rest of the period, outshooting the Stingers 13-3. The second period seemed more promising for the Stingers as Carabins defenseman Maude Laramée took a tripping penalty early on. Unfortunately, Concordia’s power play failed to generate many chances and UdeM took advantage of theirs. Not long after, UdeM’s Audrey Gariépy beat Purchase to double their lead. From that moment on, the Stingers woke up and started putting pressure on their rivals. Their speed was too much to handle for the Carabins defense and as a result, Carabins defender Kim Poirier was penalized for a slashing penalty midway through the period. This time, the Stingers held onto the puck and generated several chances, trapping the Carabins in their zone for the whole power play. The Carabins survived being a player down for two minutes, but couldn’t clear the puck from their zone. Concordia’s sustained offensive pressure lead to Deschenes’ goal, assisted by forward Keriann Schofield and defense Véronique Boudreau. “We had a lot of opportunities in the offensive zone, but Concordia played well defensively,” said Carabins forward Ariane Barker. Both teams displayed fast-paced and physical play in the third period. The Stingers, however, showed some indiscipline and took three penalties, which they killed off successfully. The Stingers pulled Purchase from the net in the last minute for an extra attacker, all in the hopes of tying the game. But it was too little, too late. “They’re a very physical team,” said Purchase. “We had a bit of a tough first period but we really rebounded from it and started to play our game and when we play our game were always in there. We just need to play a full 60 minutes”. Despite the loss, the Stingers remain optimistic and are focusing on the positives. 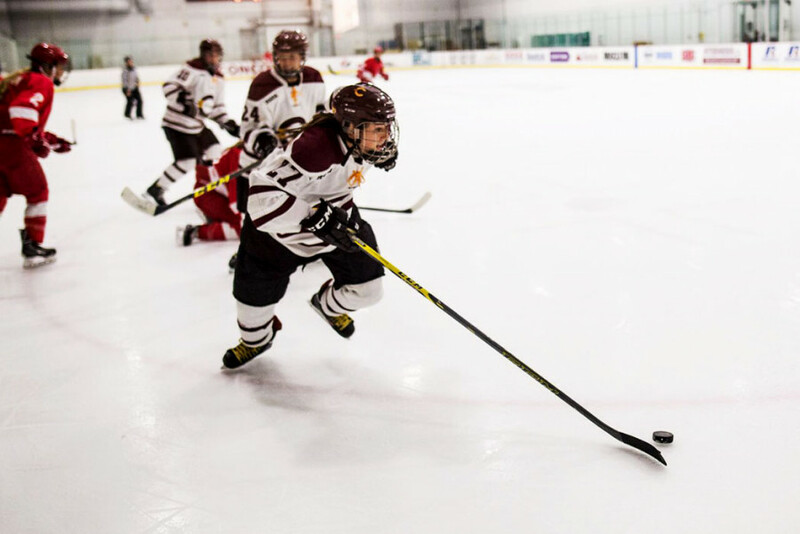 “We’ve been doing a really good job of putting the pucks on goal, getting a lot more scoring chances and scoring a lot of goals,” said Stingers head coach Julie Chu. “Overall, we’ve been scoring a lot more and playing better defensively so I think we just need everything to come together at once and we’ll start winning games,” said Purchase. The Stingers are back in action this Sunday against Carleton and will be looking for their first win since the Theresa Humes Tournament earlier this month.